The problem is that most of us know nothing about safes. Is a 200 € safety chest the same as a 2,000 € safe? What about its fire-resistance rating? What interior layout options are available? Here are five reasons why you need a safe that has the Browning logo. There are 28 break-ins every hour in France (2017), most lasting between 15 and 20 minutes. Burglars have to be in and out quickly, and quietly too. Burglars who come up against a Browning safe will have to forget about being quiet if they want to be quick. The only way of getting the job done quickly will be with the help of some C4, an RPG, a monster truck or a Gatling machine gun. The neighbours might hear something. Browning safes are so secure because we refuse to compromise on quality. It starts with the steel grade. We only buy the best, which already gives us an advantage over our competitors. But where we really win the security argument is in our painstaking manufacturing processes. While many manufacturers make do with spot-welded panels in their safes, we weld continuously all the way around. While some rival brands just attach their doors without further adjustment, we go the extra mile to provide a meticulously balanced precision fit, eliminating gaps that could be exploited by a crowbar. It doesn’t matter if it’s a Defender, a Prestige or a Zenith: our safes come with an S&G electronic lock for unrivaled security. S&G is a world leader in lock safety, whose clients include many banks and the US Department of Defense. All of these features ensure that Browning safes are certified to the most stringent security standards on the European market. A fire breaks out every two minutes in France. That’s 263,000 fires each year costing billions in damage. Insurance can cover the financial cost to families, but it can never recover the sentimental value. Imagine a B25 passed down from your grandfather to you; now imagine it destroyed in a fire. What would you do if your Browning .22, the first gun you owned, was burnt to a cinder? How would you feel if your university degree, wedding album or love letters went up in smoke? 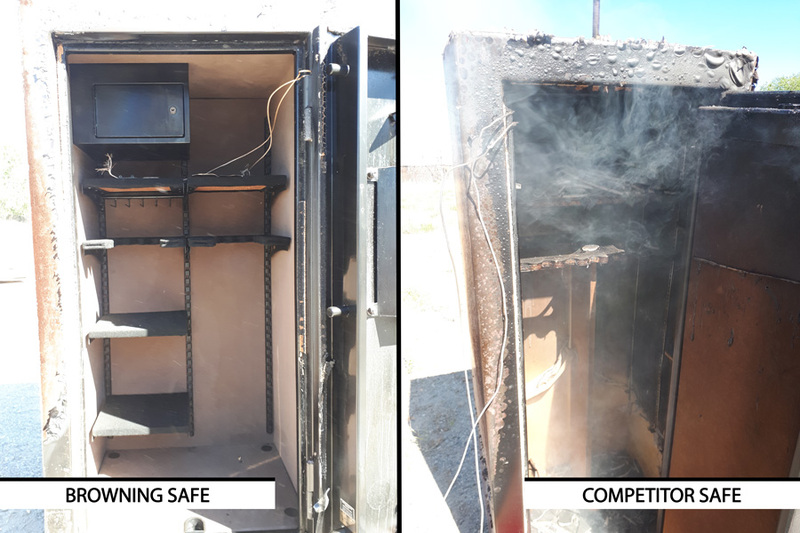 Browning safes offer unrivaled fire resistance: 30 minutes at 760° for the Defender range, 60 minutes at 760° for the Prestige range, and 90 minutes at 915° for the Zenith range. Nobody but Browning can offer that kind of performance, guaranteed. Once again, our manufacturing expertise is the reason why Browning safes are certified to the highest fire-resistance ratings on the market. To protect your most treasured belongings from fire, we fit several layers of ThermaBlock insulating panels inside our safes. That’s not all – we also fit external hinges, eliminating gaps inside the safe that ThermaBlock would not be able to protect and increasing fire resistance by almost 200%! The fact that we also continuously weld the structure is another plus point. We set fire to one of our safes and to a well-known European brand safe for twenty minutes. Our safe is on the left, the rival safe on the right. 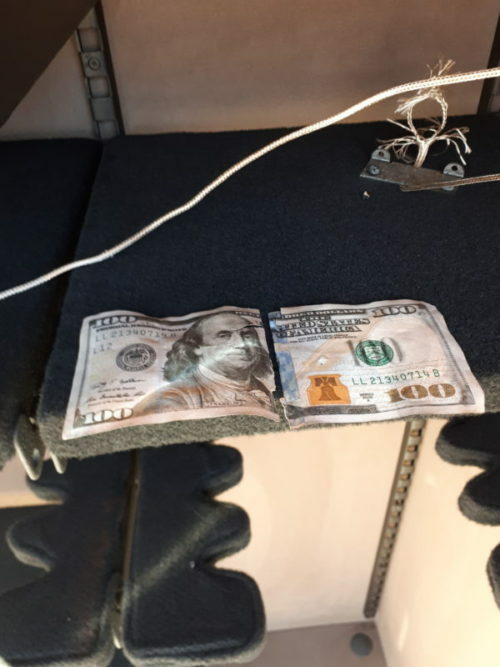 For fun, we put a $100 bill in our safe and a $1 bill in the rival safe. This is a photo of the $100 bill. The $1 bill paid the ultimate price. The interior of the Browning ProSteel safe is designed to make your life easier. Ammunition box, door-mounted storage, modular shelving: nothing has been overlooked as we aim to give you the easiest possible access to your guns! Then there is the interior carpet (also fire resistant) for a touch of added elegance. The gloss black paintwork, Browning ProSteel logo crafted in quality ink rather than stuck on with a label, chrome handles, the interior that is as stylish as it is practical… I’d be willing to bet that you’d put your safe in your living room instead of a damp corner of the basement! The Browning range of appealing and secure safes offer storage solutions with style for your most treasured valuables. Some of you might be put off by the cost of a safe. At 1,150€ for the Defender 10, 2,150€ for the Prestige 19 and 3,500€ for the Zenith 27, you might feel like buying an A-Bolt, the new Maral Compo or even a BAR Platinum, and that’s understandable. But look at it this way: a safe is a one-time investment for a lifetime of peace of mind! And you can’t put a price on that. Let’s take an example. The typical visitor to this blog is a 30-year-old man. The average life expectancy for a man in France is 80. A 30-year-old man who buys a Zenith 27 for 3,500€ will get 50 years use out of it. That means he has a safe for 70€ a year or 6€ a month. Is that so expensive? Remember, too, that Browning wants to go easy on your car suspension as well as your wallet so we offer free delivery to most countries in Europe. So, which model will you choose?